iTunes desktop app has a built-in Internet Radio where users have access to a vast collection of free, streaming Internet radio stations? Is there a counterpart for the same available in iOS? Say in the Music app. If not is there a 3rd party app which provides this feature and have access to similar stations? I often listen to a bunch on stations while on my Mac. I looking to have the same ability available on my iPhone. The same feature from iTunes desktop app is available in iOS/1st party apps. 3rd party apps which can let me listen to the streaming Internet Radio stations that are available under iTunes for desktop. Yes, it is possible but requires a bit of copy/paste work. 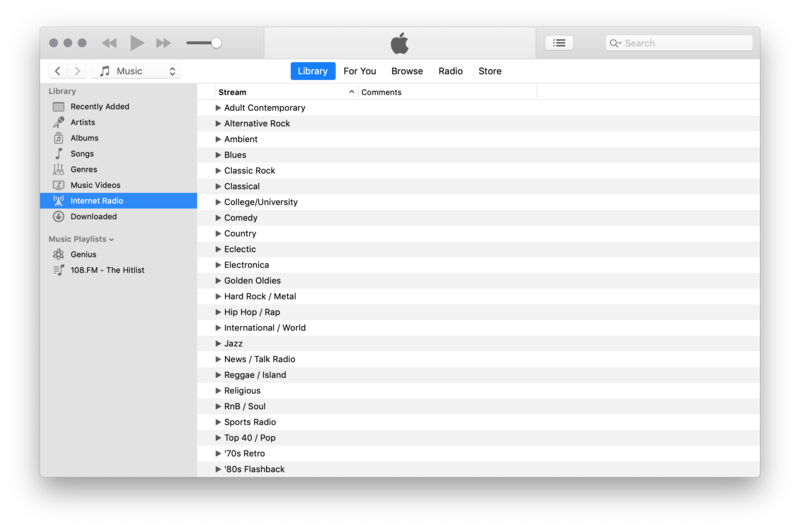 Select the radio stream in iTunes on desktop. Select the Edit menu, choose the Song Info entry (or just press Command + I). This will show you the location URL of the stream. For example, the first stream in the 80s Flashback section is A_A 80s with the URL of http://listen.shoutcast.com/a-a80svs90s. Click the URL and it will select all of the text. If you have your desktop setup to use Handoff to your iPhone, open the Web browser on the phone (Safari and Chrome both work) and paste in the URL. The page will become a simple media playback bar. If you don't use Handoff, open the Web browser on your desktop, open the bookmark manager, create a new bookmark with the URL of the stream. Hopefully you have your devices configured to sync your browser bookmarks, if so, the stream bookmark will appear in the iPhone browser. Finally if you don't have the devices configured for sync, you can copy/paste the stream URLs into a new email message on your desktop and then send it to yourself. Open the email on your phone and click on the stream URL, which should load up in your Web browser. As nohillside mentioned above, it might be easier to manage the streams using an Internet Radio app from the AppStore. You should be able to add the stream URLs from iTunes into any Radio app. Not the answer you're looking for? Browse other questions tagged ios itunes music.app itunes-radio . How can I receive FM radio broadcast signals on an iPhone 4? Why my iPhone 6s restore application and its user data by Internet even when I backup them by iTune? How do I listen to sample/preview in the iOS Music app? What's a simple & reliable way to transfer & listen to mp3s on my iPhone? How do I listen to music on my computer through my iPad?